Jack Brabham won the French Grand Prix in Reims, in the heart of champagne country, his victory in his own V8 Brabham-Repco was the first world championship win by a driver in a car he had designed himself. "Everything went well," he shrugged. "I was just kept busy winning the race." It was an altogether slightly surreal weekend. 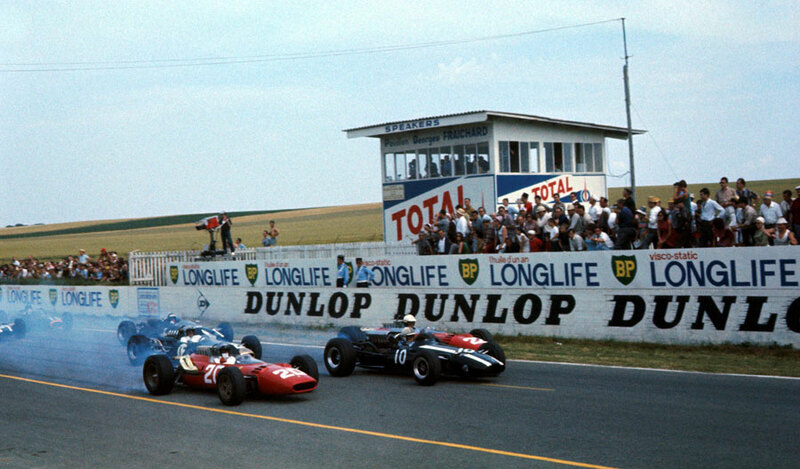 John Surtees, who had won in a Ferrari a fortnight earlier at Spa, had left the team after a row and arrived at Reims in a privately-entered Cooper. Ferrari had brought in Michael Parkes, its development engineer and a long-distance driver, and because of his height the team's engineers had spent much of the build-up adapting the car to accommodate his longer legs. Although Ferrari missed the first practice on the Thursday, Parkes repaid its faith by taking one of the three front-row places alongside team-mate Lorenzo Bandini and, ironically, Surtees. Bandini was the happiest of the three as not only did he secure pole but he also won 50 bottles of champagne for doing so. Jim Clark was a non-starter having been hit in the face during practice by a bird, and there was sad news that the first ever world champion Nino Farina had been killed in a road accident on his way to watch the race. Surtees certainly intended to have his revenge over Ferrari and led at the start with Brabham behind him, but then he stalled at the tight hairpin and retired soon after with fuel injection problems. Bandini took the lead and started to pull away from Brabham while Parkes and Graham Hill battled for third place until the BRM snapped a camshaft. Brabham took the lead when Bandini's throttle cable broke, and he finished nine seconds ahead of Parkes, who was frantically signaled to attack by the Ferrari pit having until then been told to hold his position, with the rest of the field more than two laps behind.